What: Peruvians swear by ceviche as a hangover cure, particularly the citrusy, salty, seafood-y liquid marinade, known as leche de tigre. So why not add America’s time-honored hangover cure — the Bloody Mary? 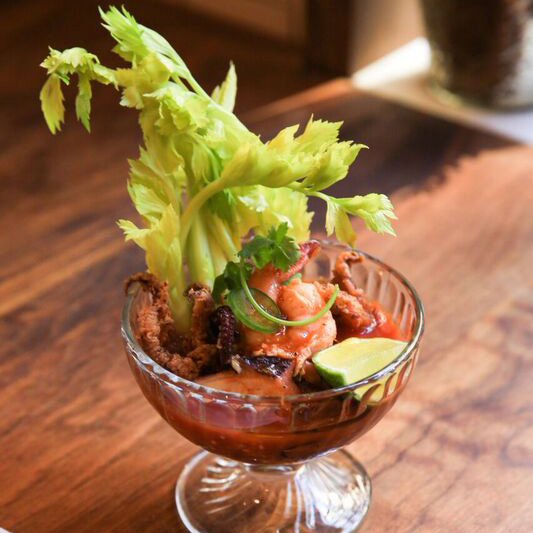 At Fifty in Manhattan’s West Village, the “Seafood Bloody Mary Ceviche” has all the flavors of a Bloody — tomato juice, lime, lemon juice, horseradish, and black pepper, plus aji amarillo and bonito flake, with healthy portions of shrimp, octopus, fried calamari. A celery garnish finishes it off. Wash it down with: The restaurant’s house Bloody has many of the same flavors — or opt for the coffee cocktail, with bourbon, Galliano Ristretto, cynar and espresso.